For the past couple of months I have been talking with an LA based publisher about a book deal. Weeks of long-distance negotiation has resulted in a preliminary agreement and I have found an agent to help with finalizing the process. Now, one of the editors has asked me to begin “trimming the fat” from my portfolio. They want me to choose what I think might be my best shots of China and then apparently they in turn will choose what they deem to be the best of the best to be published. Since I don’t know what to expect really, I find the process a bit daunting. For the past two weeks I have been going back and forth agonizing about what should be considered, changing my mind up to five times a day! I want to make sure I am including the shots that others will find most interesting and not just what my own personal favorites are. It’s not easy. 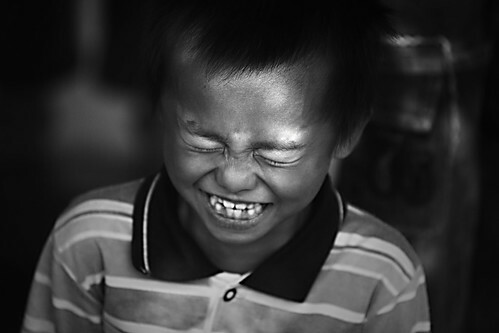 That being said, I thought I would share some of my personal favorite portraits from China. These are all “street” shots if you will, nothing from the studio is included here. Some of these may end up not making the final cut but i include them here because they all mean something special to me. In early May of 2008, I traveled with a local photography club to a small village in Luzhai County. I saw some great faces in Luzhai but I really couldn’t communicate much. The local dialect was nearly impossible for me and my terrible Mandarin was definitely impossible for the locals. I was struck by the gentleness of everyone and their kindness. I was invited inside homes more than once and children followed me around the narrow streets. I was able to determine that this old fella’, at 92, was the oldest man in the village. His back was still ramrod straight and despite the cataracts, he looked me dead in the eye when he spoke. It was a hot and humid day and you can see the sweat rolling off his face. This little one is my former neighbor, baby Yao. At first Yao was quite afraid of me but one day last September we finally had a break through. Trying to make him feel comfortable, I did a little jig and sang a goofy song with the camera and I was glad I had it with me. I have never seen a reaction like that before or since. He covered his face and started laughing like he was possessed. I thought sure the boy was gonna’ wet himself. Yao grew quite attached to me after that, often crying and chasing after me when I would walk through the courtyard without stopping on my way to work. I have not seen him since I moved across town more than a year ago. I think I should probably pay the family a visit before my holiday is up. I found out in December that I’d won a grant to produce a photo documentary on various groups of these street performers. They are made up of retirees who perform on weekends and holidays in local Liuzhou parks. Ms. Chen, will only tell me she is well into her 60’s. 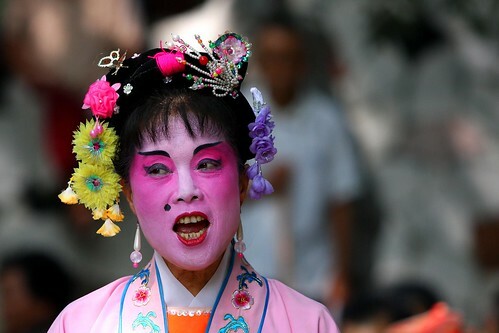 She is shown here working her way up the scale in the classic, very distinctive, shrill vocal style of traditional Chinese opera. It grows on you. The lengths these folks go through to put on a show is impressive. It takes each performer about an hour to don the makeup and elaborate costumes. The colorful wardrobe is all handmade by members of the cast. You can read more about the project here. 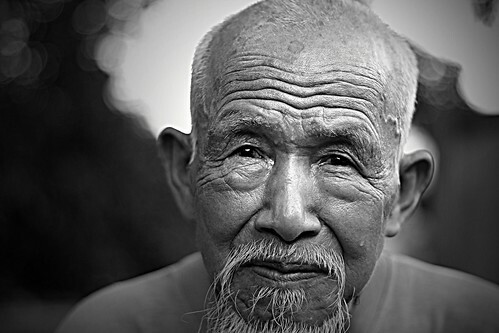 One of my favorite portraits so far from China. This motorcycle taxi man was intently giving me “the look”, as we foreigners often refer to the intense stares we inevitably receive here. This fellow was more bold than most, continuing his gaze even after I raised the camera (that usually stops the staring). I actually had no intention of taking the shot until I saw his intensity in the viewfinder (I was borrowing a friends 70-200 IS 2.8 lens – I liked it so much I later bought my own). It’s one of my favorite memories. After taking the photo, I walked over and showed it to him. It was then that I got a big grin and some excited local dialect I couldn’t understand! A few days later, a devastating magnitude 7.9 earthquake would rock Sichuan province. China changed for me that day. I saw the country, the people, in fact the world, differently from that day forward. This is a very recent shot. A few days ago I spotted this nattily dressed cat in Liuzhou’s Yufeng Park. He was celebrating Spring Festival in the park with a few thousand of his close friends. It was a beautiful January day with a temperature of about 21C under clear blue skies. I remember thinking to myself , enjoy it while you can (the weather). I am not certain why I like this image so much. Something about all the blue and gray tones and how the composition came together. China smokes. 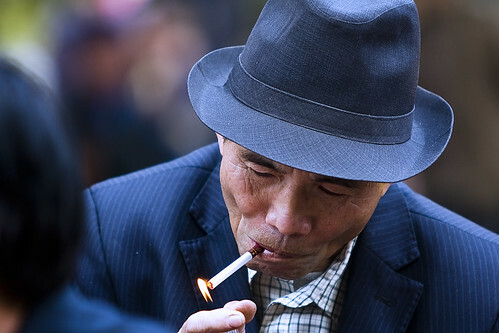 China smokes a lot. You can see some startling numbers here. Charlie Chaplin in China. 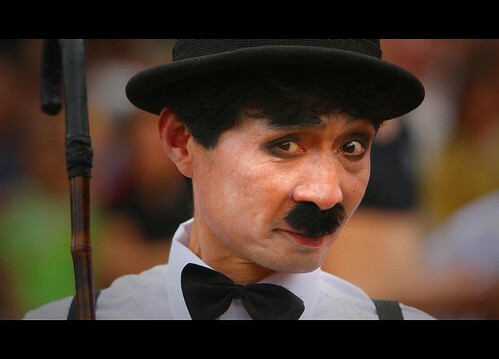 The International Clown Festival made its second appearance in Liuzhou this past summer and tens of thousands made their way to Long Tan Park over the Labor Day holiday. I found this Charlie Chaplin impersonator behind one of the stages and he immediately went through a litany of poses for me. I have another nice shot of him in black and white but I like the colorful backdrop here. Most of the performers at the festival were from the old soviet bloc, including this small man from Bulgaria. 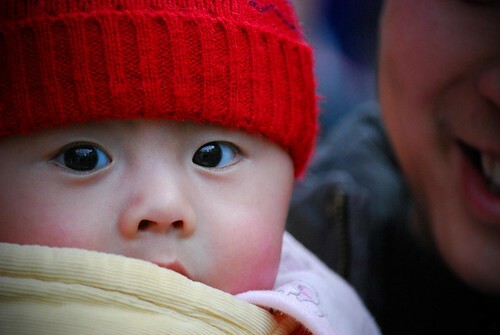 This baby boy and his proud Dad were out enjoying New Year’s day, January 1st, 2008 near Liuhou Park. Dad was keen to have to have the boy’s photo taken and I was happy to oblige. This was a sweet kid, very animated and happy. I remember it made me happy the rest of the day. 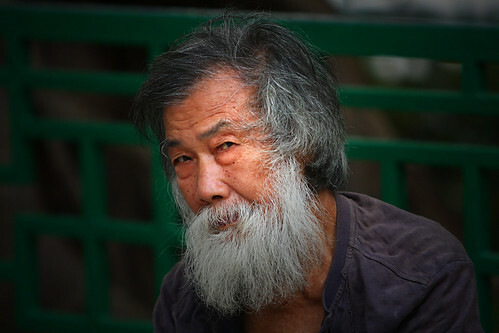 A wary glance from an old man sitting outside Man Mo Temple in downtown Hong Kong. His attention was soon lost on a small puppy. A man had the pup there in the park and it couldn’t have been more than a few days old, a newborn, weakly prancing around on unsteady paws to a crowd of onlookers. It was actually a strange moment, what with the pup flailing around and the three Laowai with cameras. I think I’ll start a collection dedicated to Frederico Fellini, for all the Fellini moments I have here in China. This is a favorite for a variety of reasons. I liked the light and the man’s weary expression but it was also my first visit ever to Hong Kong and I spent the day there with my good friends Robert Lio and Arndsan. This next shot came from another day spent with Bob Lio. During our walk in the countryside near Liuzhou Teachers College Bob and I came across a rural primary school. We ventured inside during recess and I was amazed at how quickly the kids descended on us. In seconds we were surrounded by these adorable, giggling, dirty, out-of control kids. They weren’t afraid but it was clear it was a first-time experience for many of them. It was a blast for us too. This kid absolutely lost it every time I raised the camera. I am not kidding, every single time he was in hysterics. Of course that made me laugh which made him laugh even harder! And that brings me to this latest shot, one I just took this afternoon. Folks were still out in droves enjoying free Spring Festival performances in Yufeng Park in unseasonably warm weather. There was such a melancholy about this old gal. I watched her for a while and caught myself wondering what was going through her mind. She was in the front row but her thoughts were a million miles away. It would have been easy enough to talk to her but in the end I decided it was more interesting to let the viewer decide what she might be thinking about. 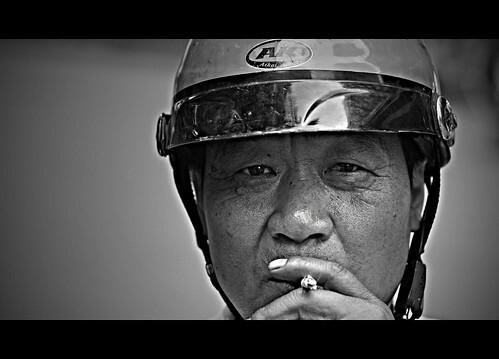 So, there you have it, 10 of my favorite street portraits from China. It’s not the definitive 10, in fact I changed my mind more than a few times about three of these shots just in the last hour. As I said, it isn’t easy, you should sit down and try to do it sometime! So I guess there is a football game for you to watch over there huh? I am not a Steelers or a Cardinals fan so this year I’ll only be interested in learning what the commercials were all about. It sure is weird being away from all the Super Bowl hype. I don’t miss it. Funny thing is, I am still up early to “watch” the game on ESPN.com. Updates every 30 seconds! ~ by Expatriate Games on February 2, 2009. These are all great especially Baby Yao, Suspicion and Remembering Youth… all stellar. Good look with the book. Happy to give a plug here in Tokyo. I agre with your other readers…. hmmmm… I like them ALL! 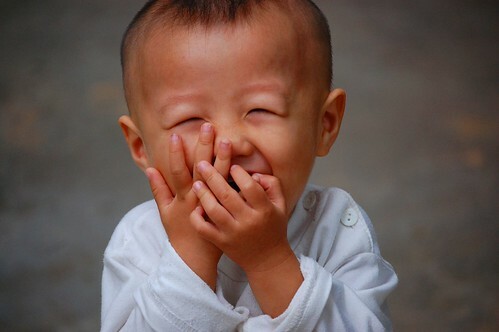 Perhaps you should have a poll… I like the little boy though.. Baby Yao…what a sweetie! Looked several times now, but honestly, I can’t decide. They are all wonderful in their own way. Going through your Flickr pages I even would like to add some. A book, congratulations, that is sooooo exiting! Great shots, all. The Man Mo Temple in HK is pretty cool. I have some great captures from there. Sorry. I’m probably just making things harder on you. Yeah I like all of those, I’m sure they’ll all be considered. This was difficult enough, choosing just the ten for this post. In the end I decided to chose some shots that, in one way or another, were very personal for me. I also tried to limit the selections to just one image from a particular set, i.e. the pink-face opera performers. The criteria for the book will be a it different. Your right of course, you have made it more difficult, so thanks for that. The theme is still being discussed. I thought I had it all mapped out it my fuzzy little brain but it is being massaged daily by external input. There are a number of ways to go. I need to decide just how far I am willing to push the envelope from a journalistic perspective. I think you know what I mean by that. 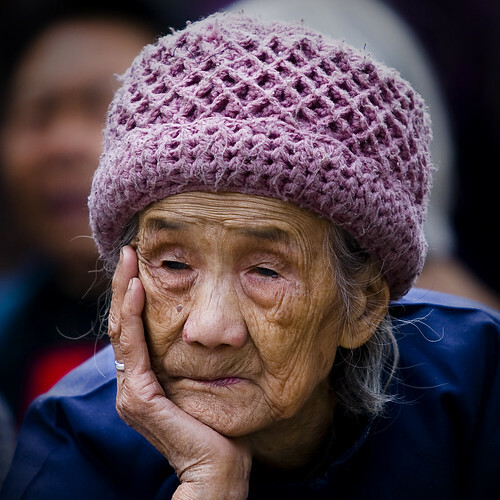 If I want to stay in China for the long haul, I have to take content and context into serious consideration. I don’t post a lot of the “less harmonic” images on the flickr site, or here either for that matter. I am sure to you , the reasons are obvious. As for now, it looks like it will be a fairly benign look at China through one laowai eye. Still, I hope there will be enough material to make it interesting. We’ll see I guess. I’ll take most of the upcoming summer break to shoot in different locales. Beats hammering nails somewhere. Thanks for taking the time Jason. For those of you who want to see some great multi-media reportage on China, take a look at Josh’s site, http://www.chinfamous.com/blog/. Wow!! Your book will coming soon! Very exciting! Congrats Michael, that’s very good news. You know..I can’t choose which one is my fave. Because all of them are my favourite. All 10 photos are NO.1 !! All of your photos are amazing. It’s really hard to pick just one. Congratulations on your upcoming publication. After seeing a taste of what might be offered, I can tell it’s going to be a huge success! Awesome shots! i thought i could click a lot from the poll, turns out i can only vote for one! i went for the “remembering youth” 🙂 great stories behind each photo, too. Wish I could do some more street shots here in bj, it’s freezing cold and i might just drop my camera. Cheers! Hey! When did you decide to go to Beijing? I have missed a lot I guess! I’ll try and get caught up with you soon!